Since my last post, I was reminded of the existence of this, from Radical Cartography. 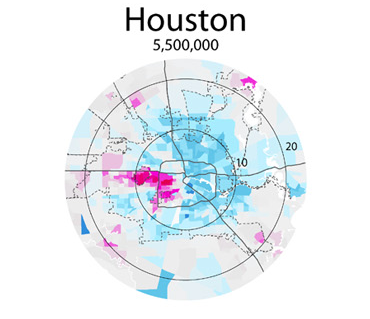 One point Bill Rankin makes there, which is really important, is that the “donut model” of economic geography, with concentric circles of high- and low-income areas, is really not the American standard. More common is the “wedge model,” with a “favored quarter” radiating out from the city center like an especially privileged slice of pizza. …you might reasonably ask: how sure are you that the growth of a high-income zone in the central city is following the donut model, versus the wedge model? After all, it seems to be growing mostly towards the already super-wealthy northern suburbs. Maybe the endgame is a wedge, after all. To which I would reply: yes, I think there’s something to that. But what matters, I think, is what’s at the center. Going back to the rent gap theory, a building’s potential rents will only be high if it’s close to jobs or amenities that make the area valuable. In all of the extreme wedge examples above, the downtowns don’t really serve quite the same central economic or cultural role for their respective metropolitan areas as does downtown Chicago, and so areas adjacent to them – say, the southern end of downtown Atlanta, or the areas to the north of downtown St. Louis – aren’t especially close to a major job or amenity center. Instead, those centers are further out in the suburbs, and high rents revolve around them, following major transportation corridors. In other words, northern Bronzeville’s position, I’m guessing, really isn’t anything like whatever neighborhoods are a mile or three east of downtown Houston: it’s actually in close proximity to the region’s largest amenity hub, and they aren’t. Who could say no to working here? Naperville, Illinois. Forgive my urban snobbery. Anyway, the point is that things are complicated, and basically every major metropolitan region in the world is polycentric, which does weird things to potential rents, and thus the prospects of disinvestment and reinvestment. You don’t even have to go outside the city to see that: though it’s much less dramatic, Hyde Park – the little patch of white along the south lakefront – has seen a very small ripple of reinvestment expand from its major employment center, the University of Chicago. The problem there, of course, is that Hyde Park is surrounded entirely by black neighborhoods (and South Kenwood, a mixed neighborhood, beyond which is North Kenwood, and almost entirely black neighborhood), which, as we discussed last time, makes the reinvestment stage difficult. First, ha ha funny with your Naperville pic. I lived there for years, not far from that pic’s location, and the I-88 corridor is quintessential sprawl. You raise a good point about high-income residents moving further out. I agree that the “wedge” is the end game in Chicago; a unified line of north lakefront affluence stretching from Lake Forest to the Loop. I believe that it will stretch further southward, past Bronzeville and to Hyde Park, maybe Woodlawn and South Shore over time. But this would be an extension of the wedge and proceeding inland will probably never happen. Another consideration: I see redevelopment in Chicago stretching only as far as the boundaries of the boulevard system, except along the lakefront. The big constraint beyond the boulevards is the quality of the housing stock. Inside the boulevard belt are gracious older homes, 2-3 flats, and beautiful apartment buildings. Outside? Frame workingman’s cottages, until you get to the bungalow belt. Think of Washington Park vs. Englewood. Reinvestment will be far easier in one area, far more difficult in the other. I think the building stock quality argument makes sense, as we’ve talked about before. That said, there’s still a *ton* of neighborhoods within the boulevards that are nowhere near gentrified: East Garfield Park, parts of North Lawndale, Little Village, Washington Park, etc., etc. I’m waiting for the first inner-ring bungalow/two-flat suburb to gentrify, too. In twenty years, I wouldn’t be surprised if there’s a little hipster quarter around downtown Berwyn or something. There already is. Berwyn is coming up as rising rents and development squeeze people out of Oak Park. Too bad the CTA doesn’t extend the Pink Line to its original terminus. Huh, interesting. I’d really love to get a better sense of these changes in the suburbs, but suburban Census tracts are generally too big to capture changes in their small downtowns, and I don’t really know anyone who lives out there. Where do you get your info from? I sometimes drive along Roosevelt and some of the development on the Berwyn side is spill over from Oak Park. It used to be a grittier path with the bars on the Berwyn side because of Oak Park’s blue laws. But things are slowly changing. Parts of CIcero are a mess but some parts are getting nicer too. I’ve seen the whole west side change from Clinton on out. It got worse around Lake and Kedzie but nicer on Lake between Ashland and Clinton. Austin is still in bad shape but it is only a matter of time. Let me know if you need any better suburban intel, I don’t go to the south suburbs anymore but I’m around. Well, all of those (with the exception of Avondale) are within the boulevard system. I do think that because gentrification seems to be driven by downtown jobs and amenities, gentrification will focus on areas that are at least accessible to downtown on public transit within 30-45 minutes. I’m less convinced, frankly, that walkability has an enormous amount to do with it – that may matter for some of the traditional demographics of first-wave gentrification, but I think available evidence suggests that residential patterns are driven more by the existence of other amenities. Witness, for example, the I-80 corridor. I’m trying to think about it from the perspective of Boston, Washington, and San Francisco. 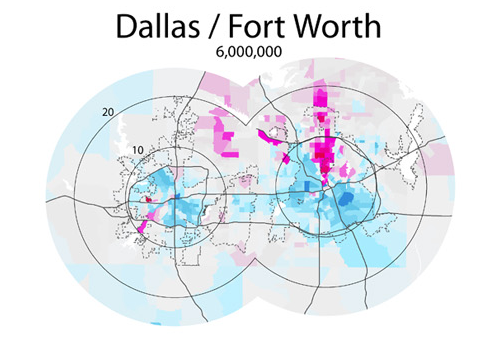 All three are very much wedge cities rather than donut cities. They also have gentrification, although Boston has a lot less than you’d expect, given how low the rents still are in Roxbury and Dorchester. There’s definitely racial arbitrage to be made in the Boston area, given that Dorchester still allows reasonable commutes to jobs in Cambridge, although not to Route 128 (which is a beltway but is only a major job center in the favored northern and western directions). Washington and San Francisco have more pervasive gentrification to my understanding, with a lot of neighborhoods that are underpriced relative to their access to the typical gentrifier jobs. Coming to think about it, it’s useful to think about gentrifiers’ jobs, versus the jobs of non-gentrifiers of equal income. Usually, gentrifiers come from outside the region: the average upper middle-class lifelong Bay Area resident has a social network around the neighborhood or suburb they grew up in, and has no reason to move to the Mission. For obvious reasons, anti-gentrification fights focus on outsiders to the neighborhood, but in practice those are usually outsiders to the entire region. Usually they work in signature industries that draw from far away, which in the Bay Area means tech. It’s not just that anti-gentrification activists wouldn’t say anything about high-income doctor and lawyer NIMBYs in the already-rich parts of the city; it’s also that those doctors and lawyers don’t seem to move to these neighborhoods, but programmers do. The importance of this is that gentrification follows not just access to jobs in general, but access to jobs in specific industries in particular. In that case, idiosyncratic distribution of jobs in these industries may matter more than whether the metro area has wedges or donuts. Things that come to mind: so much of Washington is black, and has been for a long time, that it might affect the regional pattern there. San Francisco’s geography is so weird that the “concentric circles” model doesn’t really work, because the effective distance – the time-distance – to downtown is so warped by water crossings, or has been historically. I’d think the tiny amount of space they’re working with would have some effect. I’m not sure to what extent gentrifiers are outsiders to the region. That would be something that’d be really interesting to try to quantify. Has anyone done that that you know of? But I agree in that I think social networks are under-appreciated factors in neighborhood change. Early stage gentrifiers are generally people of the same social class as the mass affluent – that is, they went to the same high schools, watch the same TV, are likely to have friend groups that overlap – but who don’t make as much money, either because they’re younger or chose a different career path (arts or teaching instead of banking, say). But they still want to be close to social networks in wealthier areas. I think that’s another factor in a place like northern Bronzeville, which is closer to downtown jobs than, say, Humboldt Park, but significantly further from those North Side social networks. And yeah. Gentrifier jobs. I want someone to do a study on this. Alon? No idea if it’s been studied before, sorry. 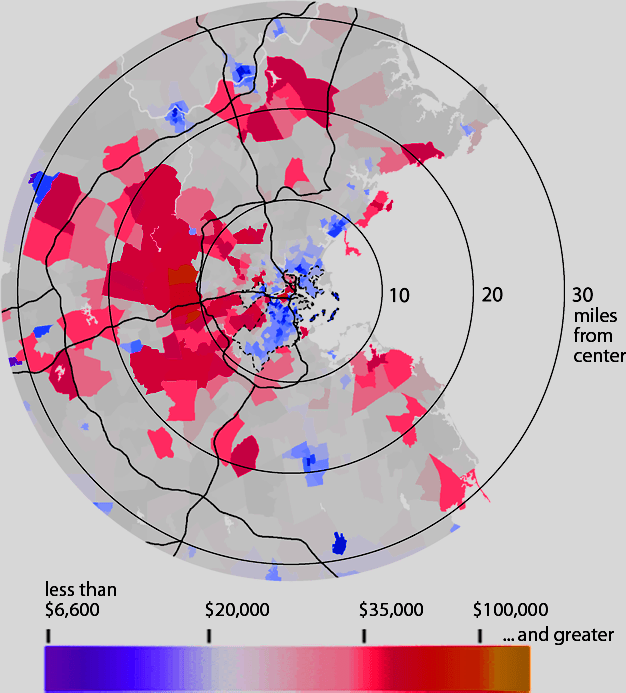 Boston looks like a donut overall with a rich city center, poor inner ring, and then affluent suburbs. 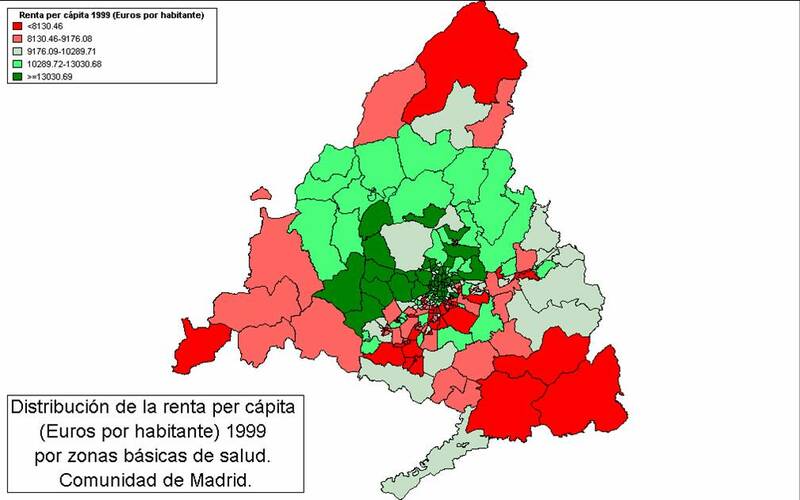 The inner ring to the south of the city center is poorer than the northern part of the inner ring. Plus, Boston has such a high student population in that inner ring (mostly to the west and north of the city center) that pulls down the income average without giving an impression of low income. Unlike Chicago, the wealthiest suburbs are mostly closer in ones and there’s a very wedge, connected with the Route 128 corridor and maybe the universities. The fact Boston is surrounded by more old cities and towns makes the pattern more complicated further out. Suburbs are generally poorer, unlike Paris. Completely different from any American pattern. Different parts of metros rise/fall with particular industries. Chicago’s South Side boomed with heavy industry due to its superior rail/ship connections, but the resulting pollution was one factor that pushed office employment and plush residential away. In more recent years and, the rise of finance/government downtown, eds/meds in “midtowns,” and the concomitant decline of urban industry all go a long way towards explaining the rise/fall of particular urban neighborhoods. Is Evanston serving as a “Midtown” in this formulation, then? Yes, although Streeterville is the more obvious example. Note that clusters of weaker institutions (IIT/Reese and UIC/Rush) were incapable of generating similar wealth, due to the paucity of benefactors who lived on those sides of town. Huh, I hadn’t thought of Streeterville that way. I guess it makes sense – Chicago has two CBDs, but they’re contiguous? Do you think of it that way? From an outsider’s perspective, the Near North Side / Streeterville felt like part of downtown, just less office only. Doesn’t make sense to consider it a separate CBD, at most an extension of the main of the CBD. In Boston, Back Bay and the Financial District are more separate, there’s other stuff in between. Yeah, that’s always been how I’ve thought of it. It’s true that Streeterville/River North really don’t fill the same economic roles as the Loop – more hotels, institutional employers, and tourist-oriented retail/etc., as well as residential – although on the residential and hotel side, the northern/eastern Loop is sort of transitioning to a Streeterville/River North model, while office moves to the West Loop and southern/western River North. The Metra vs CTA commute time arbitrage is definitely a factor on the far north side (Rogers Park etc). Time to loop is shorter from Elmhurst, Park Ridge, Evanston than it is on the red line from anywhere above Loyola. Not many other cities have 1 viable public transportation network, let alone two overlapping ones. Also none of those other “wedge” city maps have their downtown abutting a major body of water (not counting rivers). So some eastern seaboard comparisons would be interesting. I firmly a believe a critical factor in Naperville’s boom was securing a Metra line with an express non-stop service to the loop (30 minutes) during rush hour. An express Metra links high paying downtown jobs to lots and lots of cheap land farther from the city center which primes it for “fresh” suburban development. It’s affordability (on a price/sq foot, plus school quality, plus commute time to loop basis) is still largely unmatched today around the metro area. That’s why it keeps growing despite a built environment that makes you cringe, the value proposition for parents. Naperville does have some corresponding commercial center also, but I think the loop commuters are a major driver. Conversely much of the North lakefront was built with 1. old money along the lakefront, and 2. corporate campus employees (Walgreens, Allstate, Sears, Baxter, Abbott Labs). While there are some downtown commuters also, many areas are actually closer in mileage (~15-20 miles vs 35) & farther in travel time (45-60 minutes vs 30 in metra travel time) than Naperville. The Northwest side has some other draws, including O’Hare and the Schamburg commercial corridor. Walgreens is actually supposed to be headed downtown, part of a broader trend that’s a combination of “recruit millennials” and “seek relocation tax incentives”. Will be interesting to see what that does to Deerfield, where the old campus is. Related, here’s a map charting rents around L-stops. Those near south side figures look surprisingly high to me, but I’m not from that area so maybe I’m ill informed. RE: Gentrifier jobs, not all of those come from outside the region. 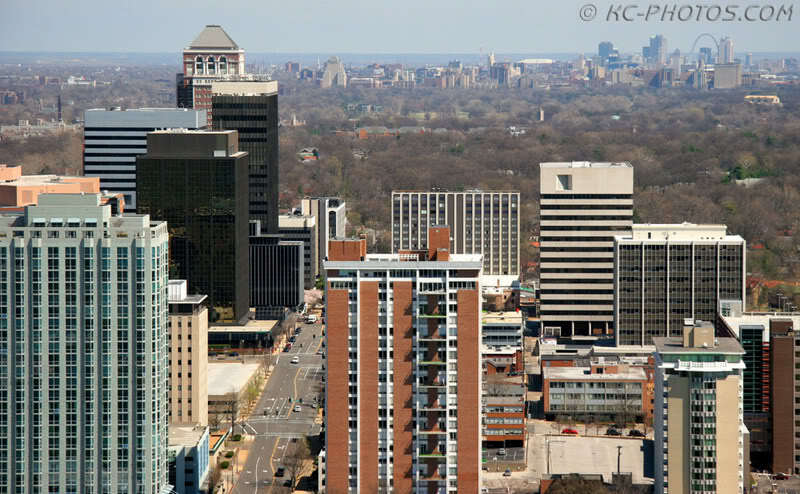 Thousands of suburban high-schoolers graduate, head to insert Big 10 University for 4 years and return to do what they always dreamed get a job and move downtown away from the sleepy suburb they grew up in. Our “outsiders” in Chicago are typically Big 10 U grads that grew up in other Midwest metros flocking to the city/jobs with the largest gravitational pull rather than being dominated by any one industry. First Lincoln Park, then Lakeview, then Wicker Park/Bucktown, Now Logan Square / Humboldt Park/West and South Loop, and next Pilsen and perhaps Bridgeport/Chinatown/Bronzeville? Are Chicago’s outsiders people from the Chicago suburbs, or from places like Columbus and St. Louis? Both? Maybe more the latter, plus a decent number of people from the coasts (especially east)? That’s really interesting re: Naperville express. I think it’s also important that commute times aren’t necessarily symmetrical: that is, people in the suburbs can get to jobs downtown thanks to Metra, but people living near downtown can’t necessarily get to jobs in the suburbs, because a large number of them don’t have cars, and suburban jobs tend not to cluster around Metra stations. Both strong cities and weak cities have wedges. 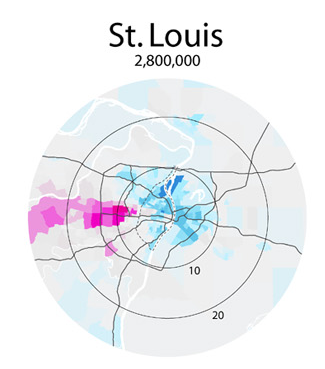 But weak cities like StL have a donut of urban poverty and then wedges starting at the edge of the city. By contrast Chicago is all wedge and no donut. Chicago has a donut! We have lots of donuts! Has gentrification on the North Side followed subway lines closely? It looks like there’s still some of the North Side that isn’t that affluent left. My guess is gentrification will focus on these areas, unless they lack convenient transportation, more than closer in neighborhoods in other sections of the city. Semi-closely. The thing is most of the North Side east of the river is pretty accessible, so it’s hard to tell there; west of the river, it’s definitely tightest around the Blue Line, but is venturing a mile or so beyond. The thing is, the only L-accessible neighborhoods on the North Side that aren’t gentrified or getting there are either a) along the parts of the Blue Line that are in the middle of a highway, greatly reducing their attractiveness; or b) far enough out on the Brown or Red lines that it’s at least a ~35 minute ride to the Loop, meaning – adding walking and waiting – that you’re talking 40-50 minute commutes. Far North Side neighborhoods like Edgewater and Rogers Park have had large middle-class contingents for years, and are very attractive areas with lots of amenities and gorgeous housing stock right on the lake, but haven’t seen anything like the sort of frenzy that’s moved from Wicker Park to Bucktown to Logan Square over the last 15 years on the Northwest Side. I think it may just be that they’re too far away. And neighborhoods to the south and west of the Loop *are* beginning to catch on. The West Loop has trendy, yuppie amenities and new construction out to Ashland, two miles west of the center of downtown, and well over a mile from what could reasonable be called the edge of downtown. Some of the hottest new food and cocktail openings – if they’re not in Logan Square or Humboldt Park on the Northwest Side – are now in Pilsen and Bridgeport, which are 2.5 – 3 miles southwest of downtown. By contrast, you don’t hear anything like the same buzz coming from Edgewater, Rogers Park, or Albany Park (which is the last neighborhood at the end of the Brown Line, and is still mostly ungentrified).